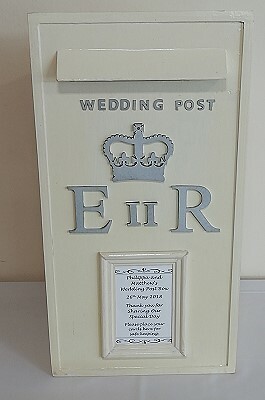 Wedding Post Box, Wishing Well and Memory Tree in the South West, Devon, Exeter, Newton Abbot, Torquay, Paignton and Plymouth. Postbox, wishing well and memory tree. Looking for somewhere for your guests to leave their best wishes cards or to remember those in your hearts who cannot be with you, we have a range of post box, wishing well and memory tree. Our cream wooden post box is freestanding and lockable. Guests can post their good wishes to the happy couple knowing that they are kept safe. Comes with a personalised message on the box. 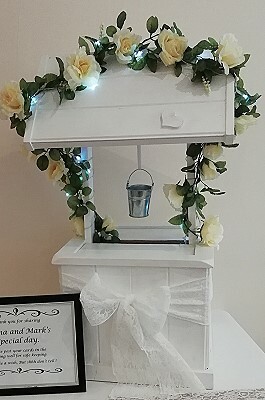 Our freestanding white wooden wishing well is decorated with a silk flower garland, fairy lights and a coloured bow. It comes with a keepsake personalised message or a poem. Our wicker basket has leather straps and hinges with a strong wicker handle, it is perfect for something a bit different. It comes with hessian bunting spelling cards and decorations to match your theme. Our white memory tree can be decorated with glass globes filled with a flower or led t-light, flowers and crystal garlands. Comes complete with framed poem and tags for messages to be hung on the tree.